DURABLE 5 – LAYER CONSTRUCTION – Aluminum сore of the frypan provides excellent thermal conductivity and heat distribution, while high temp outer and nonstick base & double top layers with stain resistant coating make meal prep easier, healthier and more mess free! The kitchenware is produced from non toxic materials and does not contain PTFE & PFOA. FROM STOVE TOP TO OVEN TO TABLE – The Copper Chef Fry Pan works on all stove tops, including gas, electric, glass top, or induction cooking surfaces. The skillet with its stainless steel hollow handles is also high temp & oven-safe, as it is heat resistant up to 850° F. The latest advanced Cerami Tech non-stick coating allows you to broil, bake, sauté, fry, steam or braise your favorite food with little or no added butter, oil, or grease and be sure – nothing will stick to the surface of the pan. 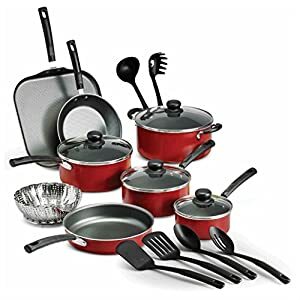 ALL-IN-ONE COOKWARE SET was designed to replace all your needs for multiple pots and utensils, like deep fryer, wok, baking dish, roasting pan, rice cooker, steamer and stock pot. With all the variety of cooking features gathered in just one deep frying pan, you can effortlessly prepare every dish you love, from soup to stew to main dishes and desserts. 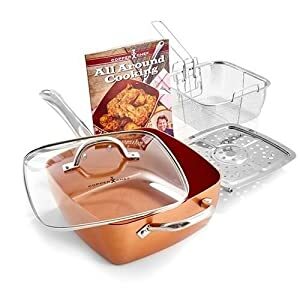 Pizza, french fries, pasta, fried cheese, risotto, crispy chicken, pancakes, cake and many more day-to-day or exquisite recipes are possible with Copper Chef 9.5 Square Fry Pan with lid .